Sam Wildow | AIM Media photo Tracy Tenney, of Irthlingborough, England, (left) with Tony Walter of Piqua (right) at Walter’s home in Piqua. Tenney, who donated bone marrow to Walter, visited the United States for the first time this past week. 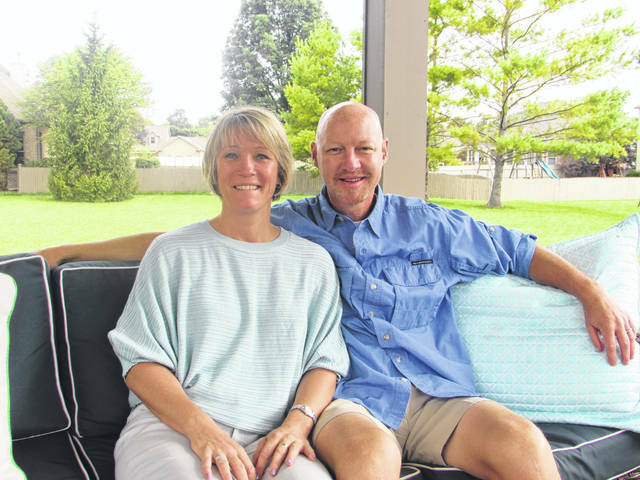 PIQUA — A life-saving procedure has led to a lifelong friendship between a local transplant recipient and his transplant donor, who live an ocean apart. Tony Walter of Piqua was the recipient of a bone marrow transplant 18 years ago, receiving it from donor Tracy Tenney, who is from England. Walter and his wife, Karen, met Tenney three years ago in England, and this week was the first time that Tenney visited Walter in Piqua. It was also Tenney’s first visit to the United States. Walter was diagnosed with non-Hodgkin’s lymphoma in May 1999, undergoing chemotherapy and radiation treatments that were not successful. Walter’s family and friends then got tested to see if they were potential bone marrow donors for Walter. “A lot of people got tested … none of those were matches,” Walter said. Tenney — who lives in the town of Irthlingborough in Northamptonshire, a county in the East Midlands region of England — was inspired to join the bone marrow registry after it was featured on a morning news program. “I thought it would be a nice thing to do,” Tenney said. Tenney submitted a blood test and underwent additional tissue typing and a few months later, was notified of a possible match. While she ended up not being a match for that person, she soon found out she was a match for Walter. “Within months, I was again a potential match with someone, which was Tony,” Tenney said. Tenney went to London to undergo the procedure, where two doctors spent two hours taking two pints of bone marrow from Tenney. The bone marrow was then given over to Walter’s bone marrow coordinator, who flew it to Ohio, where it eventually reached Walter at the James Cancer Hospital in Columbus. “I went in about 10 days prior,” Walter said. Before Walter underwent his side of the procedure, he also went through a dose of chemotherapy. Afterward, Walter took anti-rejection drugs, and his health has been fine ever since. He does not take any medication and has not had any long-term ill effects from the procedure or his past non-Hodgkin’s lymphoma. “I feel like I have a whole new family,” Walter said about Tenney. Tenney — who has been visiting Walter since Aug. 24, and will be going back home on Sunday — has enjoyed her time in the U.S. and her time with Walter, and she plans to visit again. Tenney encouraged everyone to signup for the bone marrow registry, which they said only takes a cheek swab now to get on the registry. “It’s made a huge difference in my life as well … It makes you look at life in a renewed appreciation,” Tenney said. https://www.dailycall.com/wp-content/uploads/sites/30/2018/09/web1_Tracy-Tony-cmyk-2.jpgSam Wildow | AIM Media photo Tracy Tenney, of Irthlingborough, England, (left) with Tony Walter of Piqua (right) at Walter’s home in Piqua. Tenney, who donated bone marrow to Walter, visited the United States for the first time this past week.